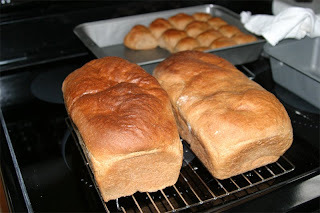 For the past few weeks, I've been making my own bread, instead of buying store bought bread. I've chronicled some of my experiences with bread making in the past. Every week, I've seen improvements in the texture and shape of my bread (practice makes perfect!) I've ventured out in to trying bread bowls (fell a little flat) and dinner rolls (pretty good) with my dough, as the recipe that I use gives me enough for 3 large loaves. Since there's no way I go through 3 loaves, and really, 2 is pushing it, I've been trying to find alternative things to do with my dough. Thus far, I've found opportunities to share my bread with others. for a total of $3.92 per batch, or $1.31 per loaf. This cost doesn't include the cost of water (4 cups) or the electricity of running the mixer or the oven. However, I don't imagine that this would contribute more than a few cents to the entire cost. Considering my preferred loaf of bread at the store costs me $2.45, and gives me about the same amount of bread, that's a pretty nice bit of pocket change that adds up - $1.00 per loaf saved, and it tastes so much better! This is a great breakdown. I've always heard that bread was cheaper to make, but I never took the time to break it down. For our once a week purchase, I didn't think it was really worth it, but as the little ones eat more, I'm finding that we go through 2 loaves a week. It may be time to go homemade!